Reviews: The Good, The Bad and The Ugly – No#3 will really shock you! Customers are, of course, the lifeblood of any business – which is why it is SO important to keep them happy. By monitoring online reviews, you will give yourself the best chance of finding out what your customers want. You can then adjust your products and/or service based on customer feedback you have received through reviews in order to receive more great reviews. An excellent improvement tool! 3. Competitors can pay people to leave negative reviews! Did you know? 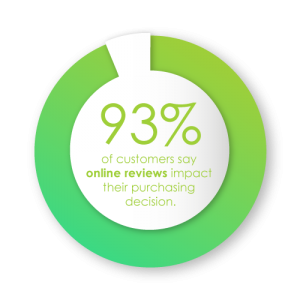 A massive 93% of customers say that online reviews impact their purchasing decisions (according to research by Podium). If you are an honest business owner who offers great products/services and always gives the best customer service, you may think you don’t have to worry about this statistic. 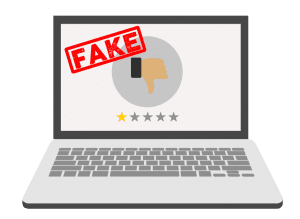 It is not uncommon for competitors to actually pay other companies to leave bad reviews, or leave them under a fake name, in an attempt to bring down your business. See our ‘Fake Reviews: What to Do’ section below for advice on this. your site to the top of search engine ranking. Don’t be fooled, though, there is more to SEO than getting a few reviews – but every little can help! What it comes down to, is that customers will trust your business more if they see good reviews. Most customers will consider your reviews before making a purchase (remember, 93%), meaning having positive reviews can encourage sales. This is because online reviews are a way of building trust, especially when you have an ecommerce site, as visitors’ trust giving you their money. In fact, a study by the Bazaarvoice network suggests that one product review can increase sales by 10%, and 200 reviews can result in a 44% increase in sales. • Form a professional response – Of course, having a negative review is not good for your business, but by responding to the review, acknowledging the issue and offering a solution (as you would if the review is genuine), you are showing other potential customers that you care about your customers. You shouldn’t accuse the reviewer of being a fake, however it is a good idea to state that you have checked your records and you have never worked for them, suggest that they could have made a mistake and ask for further details. • Report the review – You will need to report the bad review in order for it to be removed, however it can take a few days for Google (or wherever the review is placed) to respond, and they may decide not to remove it at all, which is why responding to the review will show customers it isn’t legit in the meantime.